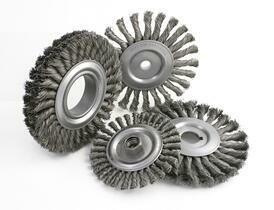 Wire wheel brushes are metalworking tools for blending, cleaning, deburring, edge blending, and surface finishing. You’ll find these industrial brushes in plenty of machine shops, but some metalworkers are using them in a way that can shorten brush tool life. For example, some users believe that power brushes work best when there’s a “scrubbing action” with plenty of pressure and friction. What happens, however, is that wire brushes used in this way wear sooner. Plus, the metal filaments can break and literally fly across the shop. For wire wheel brushes that last longer, follow these tips from Brush Research Manufacturing (BRM). With any type of power brush, avoid applying too much pressure. When filaments are over-bent, heat builds and the filaments can break. With wire wheel brushes, filaments that are subjected to excessive pressures may also experience rapid dulling for reduced brushing action. Instead of applying greater pressure then, try a wire wheel brush with a more aggressive cutting action or use the tool at a higher speed. BRM supplies both crimped wire wheels and knotted wire wheels for standard and heavy-duty metalworking applications. Industrial brushes work best when they’re the right size and the right type for the job. These metalworking tools also last longer when they’re used at the lowest possible pressure and the highest safe speed. With wire wheel brushes, boosting the brush speed increases the face stiffness and the brushing action. That’s why a fine-wire brush that’s rotated at the highest possible safe speed may produce the same results as a coarse-wire brush rotating at a slower speed. 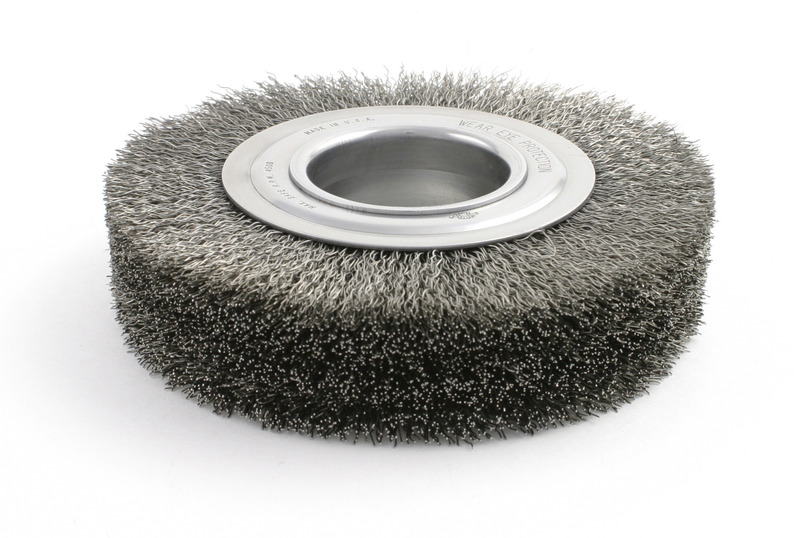 Because the faster-spinning, finer-wire wheel brush lasts longer, your shop can also reduce production costs while getting high-quality results. Remove the brush from the spindle. Flip the wire brush 180 degrees. For more information about how to increase performance while extending brush tool life, download The Use of Industrial Brushes, a free technical book from Brush Research Manufacturing (BRM).